250 Mommy Cards for Under $6 Shipped from Vistaprint! Vistaprint is offering a great deal on Mommy Cards today! You can get 250 FREE business cards that can be used for whatever purpose you need them for. I think this is a great way to have customized Mommy Cards made on the cheap! 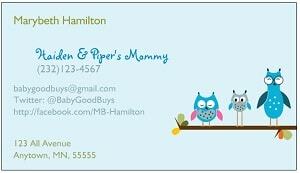 These contact cards are a great way to pass along your details to new teachers, playgroup members, coaches and friends. I created the card shown above. It has every possible way to reach me via phone, email and even social media! You can include as much or as little information as you'd like on your own cards. Go here to get 250 Free Business Cards and Just Pay Shipping! Prices on Shipping start at $5.67; that's one of the lowest prices you'll find for business cards. There are 45 designs to choose from, and you'll find everything from cutesy to corporate styles. You can also choose any of the Premium Designs for $2 plus shipping.